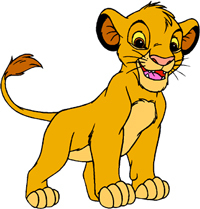 Simba was born December 28, 2003, one of five sisters and three brothers. She came to live with me on February 12, 2004 and we began what was to become a life-changing experience for me. Simba was the first dog I had had since the eighth grade and she was the cutest, sweetest, smallest thing I had ever seen. I loved her from the minute I looked into her eyes. It took me a while to name her because I had to settle on exactly the right name that was befitting such a wonderful being. This nameless puppy bounced and pounced and tormented my two cats from day one. She reminded me so much of the playful cub in The Lion King, that I knew that was the name for her. Simba means “lion” in Swahili and she lived up to this majestic name in so many ways. After a couple of months, Simba was enrolled in Semper Fi Boxer School to start learning good manners. She was a very excitable puppy, but by the time she was six months of age, she was ready to take her AKC Canine Good Citizen test. She passed with flying colors and I was so proud of her! Simba had several friends in the neighborhood, most notably a Golden Retriever named Sydney that she taught to box. She played ball in the yard, had pool parties in the driveway and visited as many people and dogs as she possibly could. She was a very sociable pup and with her sweet, gentle disposition, got along with everyone she met. The cats were still not impressed, but Simba did not let that get her down. She and Scout eventually became best buddies, but Ty made sure that Simba knew that she was still the big boss - the Mufasa Kitty. Simba, in her easy-going way, respected this and gave Ty a wide margin when passing her in the house. 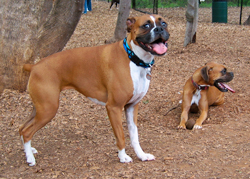 Simba played often at the local dog park in Smyrna where she met other boxers including Molly, Davidson and Nala and a strong and lasting bond was created between these boxer owners. 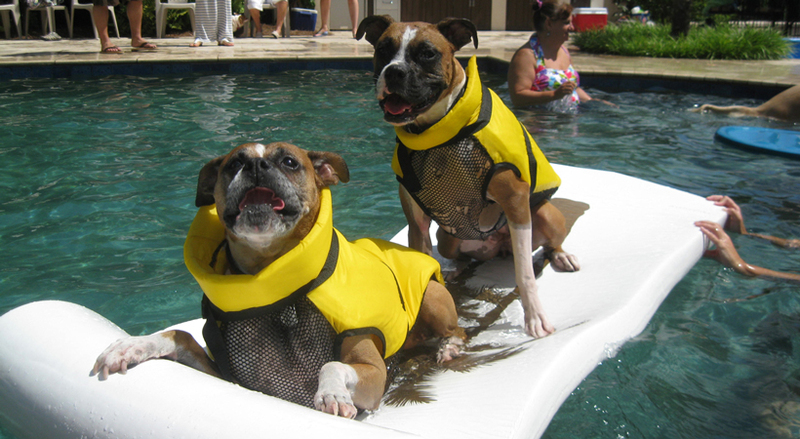 When Simba was three, it was decided that she needed more boxer friends. 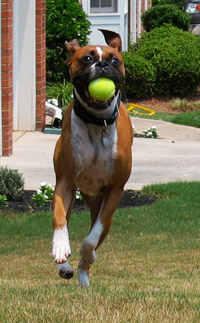 After surfing the web a bit to see what was out there in the way of local Boxer groups and not finding what I had in mind, I decided to start The Atlanta Boxer Meetup Group so Simba could keep her calendar full of playdates. 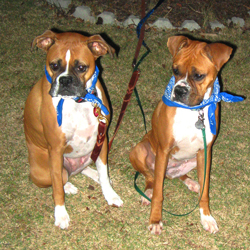 Our first “Boxer Bash” was held November 18, 2006 at Sweat Mountain Dog Park and Simba met boxers like Bella, Bruno, Emma, Sascha, and Joe that would become lifelong friends. The meetups continued monthly and Simba's address book grew and grew. Within the first couple of meetups, Simba also met Georgia, Macey, Bentley, Rowdy, Hulk and Hannah and before long, her boxer circle grew to include Emmy, Hunter, Bridget, Jake, Pluto, Carrie, Cassius, Rex, Lucy, Guinness, Brutus and many more... Simba was a very happy boxer, loved all her friends and couldn't wait to go to the Boxer Bashes every month. 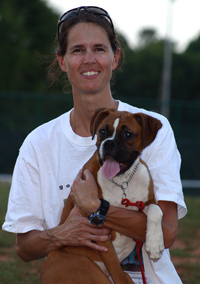 Out of this love of boxers and the bonding of their owners came Atlanta Boxer Rescue, which was formed in June of 2008. 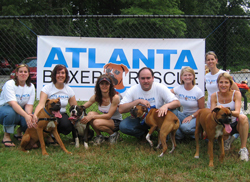 Seven founding board members and our dogs, who felt that we could do more for the community, started and built Atlanta Boxer Rescue into what it is today. Simba and her friends oversaw the mission and made sure to keep us on our path with the dogs always at the forefront of the process. 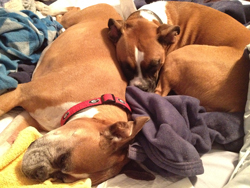 In Simba's lifetime, she saw over 600 Boxers rescued and placed into new loving homes. 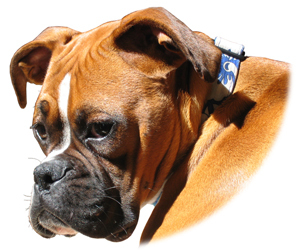 Simba endured many foster boxers in and out of the house; some like Cooper, Pixel and Sixty who became fast friends and others like Elba who would have eaten Simba alive, given the chance. Simba took it all in stride, shared everything she had and helped move all these pups on to good homes and new rich lives. 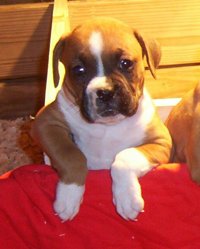 In March 2009, a very pregnant boxer named Blossom came into the rescue and nine pups were born to her a few days later. I was at the foster home watching as one very distinctly marked girl was born mid-afternoon and I knew immediately that Simba was going to have a sister. 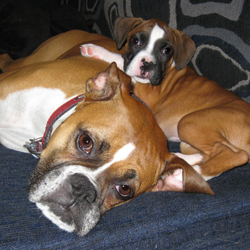 Pixie moved in with us eight weeks later and Simba was the best big sister a boxer could ever want. Simba was so sweet and gentle with baby Pixie and let her climb all over her. 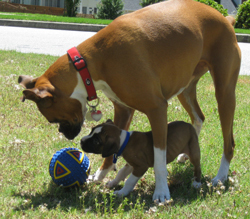 She taught Pixie how to box, very gently at first, how to play with a ball outside and what the rules of the house were. Pixie followed most of them and Simba just shook her head and rolled her eyes when Pixie chewed up yet another toy, shoe or bed. 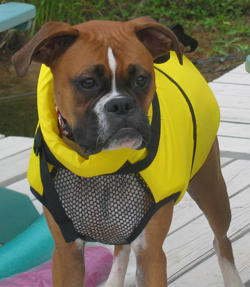 Simba loved the water like no other boxer. When she was about a year and a half old, she had a very rude introduction to the lake. I jumped off the boat with my wakeboard and Simba followed before anyone realized she was jumping too. She swam up to me and held on tight as she tried to figure out why she couldn't walk on water. 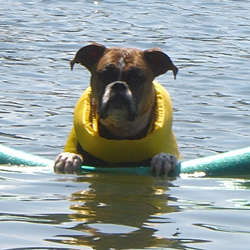 In time,Simba learned to fetch balls in the water, go tubing behind the boat, float on noodles and rafts and splash around on the shoreline.She loved diving off the seawall to fetch a ball and when she got tired, she would float on her noodle in the sun until she started to nod off to sleep. Simba always had a full calendar with hikes, dog park trips, events, dinner outings, pool parties, etc. She went to Trunk or Treat events and Animal Blessings at church and greeted the neighborhood kids at the door in costume on Halloween. She went rock climbing, played in the snow, and chased balls in the sand and water at the beach. She loved going to the bank so she could get cookies at the drive-thru, she hung out on restaurant patios and went to festivals and concerts. She went as many places as I could take her and she was always so well-behaved. She had a birthday party every year and always made the most of life. If there was something to be celebrated, she celebrated it! 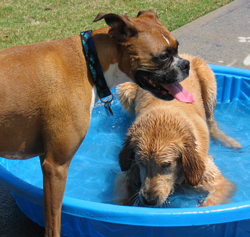 Simba spent many an hour at the dog park in Smyrna with her friends Tucker, Dusty, Toccoa, Sully, Samson, and others. In the summers when it was hot, she and her friends would wear their lighted dog collars and run around after dark until all you could see was a couple of red lights zooming around the park. She also enjoyed her neighborhood friends Sydney, Chloe, Yoshi, Cinnamon, Toby, Austin, Jacx and Cooper. Simba was always ready to play anytime a dog needed company and my front yard was frequently called the unofficial neighborhood dog park! As Simba grew older, she calmed and enjoyed just chilling on the couch or the bed or in a sunny spot on the stairs where she could watch what was happening in the neighborhood. In the winter, she got cold around 2 AM every morning and would gently nudge me awake until I let her under the covers and I spooned her until we both fell back asleep. I have never been happier than when Simba was curled up next to me. With my hand on her chest, I felt her slow steady heartbeat and listened to her quiet breathing as she slept. We had a bond like no other and one look into each other's eyes said everything that needed saying. We were so happy together. 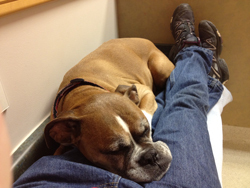 As 2012 started to come to a close, Simba became tired – more so than fitting for an eight-year-old boxer. In early December, she had major surgery to fix a problem with her pancreas and bile ducts and rebounded wonderfully from it. 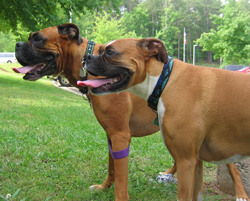 Her blood results began to improve immediately and continued improving all throughout December. I thought all was well and began planning for the wonderful years we had ahead of us. In the last days of December, shortly after her ninth birthday, she began to decline again for no apparent reason. She ran unexplained fevers and her liver enzymes began to climb. All through January, she went back and forth to the vet searching for answers, getting fluids and medications to help her over this hump. She would rebound after supportive medical care and then decline again as soon as she was taken off of it. She made multiple trips to GVS, had tests and biopsies and nothing was returning any conclusive results. The real problem still was not evident and she fought against this unnamed enemy with the courage and strength of the lion for which she was named. 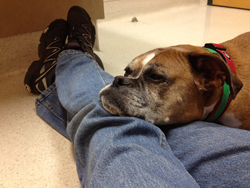 On January 30, the vets at Paces Ferry Veterinary Clinic found that she was beginning to get fluid in her abdomen. I took her directly to GVS and was planning to stay the night there with her. My friend Carol went by my house to bring us some food and things so Simba and I could stay overnight. The critical care doc spent three hours with us, tried to get a sample of the fluid to see what was in it and tried to determine what was going on. In that length of time, Simba ate two bowls of home-cooked chicken and rice and played with a ball of the floor, so he decided she was stable and okay to go home for the night. He set up an appointment with the radiologist for the next day to get a good ultrasound of her liver and to aspirate the fluid to see what it was. 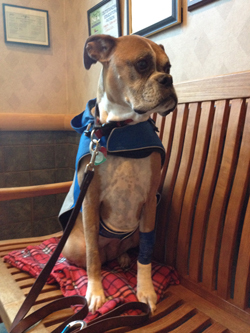 When I got up Thursday morning, January 31, Simba was fairly perky and marched bravely into GVS for yet another round of appointments. I never in a million years dreamed that it would be my very last day with her. She met with the radiologist at 9:30 and when they brought her back to my room, my entire world was shattered with the news. 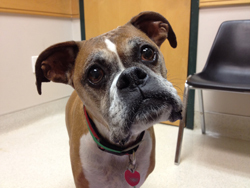 They had found cancer and very drastic changes to her liver since the last ultrasound and benign biopsy. I was in utter shock. He did one more aspiration of her liver to confirm everything and came back with the diagnosis of carcinoma. My body went cold and I could hardly breathe from the shock and devastation. My friend Terry rushed up to GVS to sit with me and we waited a couple of hours to make sure Simba was clotting from the aspirations. The doctor came in and said it was okay to go so I took her back home to be with Pixie. He said we may have as much as a week, but as the day wore on, Simba became increasingly more exhausted. We all three got into bed about 7:30 that night and Pixie curled up against Simba to sleep. Around 2AM, Simba became restless and it was clear that her sweet little body was tired of fighting. I squeezed water into her mouth from a wet paper towel all throughout the night to help keep her comfortable until morning. Pixie kept a head or a paw touching her all throughout the night. Around 5 or 6 AM, her heartbeat slowed, her breathing quieted and her beautiful spirit finally slipped away from this world shortly before sunrise on February 1. My entire world changed when Simba came into it. 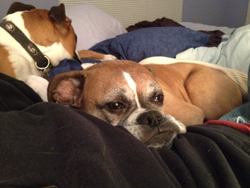 She was a very extraordinary dog, always far more human than boxer. The ripple effects of Simba's existence are absolutely breathtaking and she leaves a tremendous legacy in Atlanta. I realize this, but it does not take away the terrible, excruciating heartbreak now that she is gone. The nine years she was with me were the best of my life, but I feel robbed that we did not have more years together. Cancer stole my baby from me far before her time. Simba, I will miss you for as long as I have air to breathe and your heart will beat with mine until my last day on earth. You were the best friend and companion I could have ever asked for and I was blessed beyond measure by your love for me. There is nothing I would not do for just one more day with you. I can't wait to see you again in Heaven and if that's not where you are, then I don't want to go. Simba, you meant more to me than you could ever realize and you were so loved, my sweet girl. Oh, how you were loved!